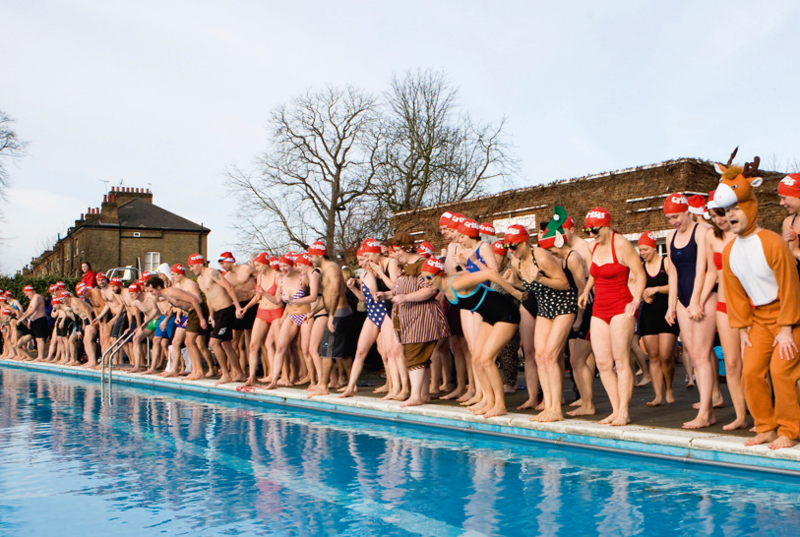 Over 110 swimmers attended the Christmas Day Swim at Brockwell Lido last year, where the water temperature was around 7°C. How warm does the water have to be for outdoor swimming? The short answer is that there are no authoritative guidelines, as there are for indoor pools and spas. And of course, outdoor swimming can mean ponds, rivers, the sea… It can include wet suits. But here are some rough guidelines. Swimming in water that is less than 10ºC needs a little care. Limbs can become weak and swimming 25m is quite an achievement. Coming out after even two minutes, the skin may become orangey-red and though the water may bite, issues such as hypothermia can be simply dealt with by warmth. HEALTH WARNING : There is a slight health warning, though. Breath may start to come in big jolting gasps (hyper-ventilation). This phenomenon, known as sudden immersion syndrome, is a dangerous reflex. Acclimatisation should help, as can slow immersion, splashing cold water on the trunk etc. Some open-air swimmers swim all the year round, having eliminated the reflex. Of course, there are positive pleasures to be had from really cold water swimming. The ‘cold water high’ comes from a rush of endorphins. Winter swimmers can become addicted to this effect, and it is sufficiently powerful that a two minute swim can leave bathers feeling good all day. Anecdotally, winter swimming clubs report increased immunity and fewer colds. Water temperatures between about 10 and 15ºC still require some bravery; plunge pools are around this. The Amateur Swimming Association recommends 16º as a minimum for open-water swimming; that’s an average sea temperature in the UK. You might expect 20ºC or so in lakes and big rivers at the height of summer. COOL CUSTOMERS : As for pools, it is rare for them to attract customers if the water temperature is below about 20ºC. Some school pools operate around there. With an unheated pool, that’s about as much as you can expect. Outdoor pools tend to be heated these days, and usually aim for 25ºC. Temperature can be critical when teaching children to swim – particularly if they’re thin and young, so 30ºC may be needed to avoid cold stress. Pool managers and swimming teachers should be aware of this issue. As 30ºC is unlikely out of doors, the important thing for potential bathers is to be told the temperature. If they are reassured that it’s as warm as the Mediterranean, they can work out whether to chance it. But they might want to wait for the rain to stop before they decide. Visit the PWTAG website for further guidance – www.pwtag.org.uk.